Symphony of Waves is a new piece by the Pandemonium Drummers for Danny Boyle: Pages of the Sea in Folkestone to coincide with the 100 year anniversary of armistice and the end of the First World War. 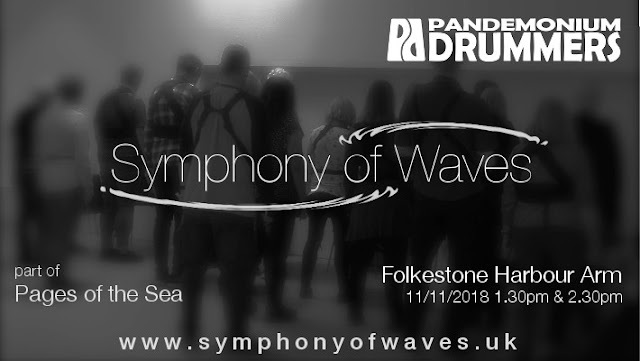 Symphony of Waves premiered on Remembrance Sunday, 11th November 2018, at Folkestone Harbour Arm to hundreds of spectators, including Danny Boyle, who commented that the performance was "very moving". Presented by over 40 drummers, the semi-improvised piece explores the concern, anxiety, and commitment of those who left home and started a journey across the sea, from which many did not return. The 14-minute piece is performed on simple buckets and bins and evokes memories of a pleasant land left behind and outlooks of an uncertain future. Symphony of Waves will be released as a community resource in mid 2019 to invite performances by other groups. The Pandemonium Drummers​​ started as a 1,000-strong group of volunteer performers in the Industrial Revolution segment of the London 2012 Olympic Opening Ceremony. They have performed over 250 times since in a wide variety of settings from major stadium sports ceremonies to arts festivals and community events. With about 100 current members, the Pandemonium Drummers are now a charitable group of voluntary amateur community performers, who uphold the Games volunteering values of Openness, Inclusivity and Engagement and bring enthusiasm, energy and enjoyment to their audiences.